« How Do You Know When Enough’s Enough? When Was or Will Your Family Be Complete? Busy in the Kitchen This Holiday Season? Here are Some Great Ways to Get Your Children Involved! Ask stay-at-home caregivers what the toughest time of the day is and you'll hear a universal response: dinnertime. This is the hardest segment of the day when moods turn to the dark side and tummies begin to growl. Not only is the food-prepping parent responsible for getting dinner on the table, but must concurrently keep the kiddies relatively calm. And hum a joyous song while doing it, a la Snow White. Expect that, especially during cooking-heavy holidays, you will orbit the kitchen much of the day with tiny tots and testy teens trailing close behind. Embrace this obvious reality now or prepare to pull out every hair in your swiftly graying head. Get cookin' with the kids--even the youngest ones! This does not mean you hand the torch to Junior to put the finishing touches on your holiday crème brulee. It does mean, however, that you plan ahead to integrate the whole family into mealtime preparation. Developmentally, toddlers pose the toughest challenge for a cooking parent. Carol Williams, a registered dietician at Children's Hospital in Columbus, Ohio, tells parents that, "Touch is a sense used to help get unfamiliar foods closer to a child's mouth," which means that your picky toddler may be more willing to eat your slaved-over meal by cooking with you. Don't expect to keep a tidy workspace, she explains in an article for Baby Zone, but take advantage of her enthusiasm to help. Sanitary Specialist: Wash hands, put on an apron and discuss how to correctly measure ingredients. Continue to remind Junior not to eat the ingredients as you prepare them. Super Scooper: For ingredients that don't need to be measured perfectly, let him scoop the measuring cup and dump the goods into the proper place. A simple green bean casserole is tough to mess up. Avoid doing this with baked goods, which need to be precisely measured. Can Opener: Electric, safe-edge can openers make life so much easier, plus you can help your little one learn how to safely open cans with it. Let Junior open the condensed milk and pour into the pumpkin pie puree himself. Relish Tray Artist: Letting your little one put carrots, celery and olives onto the relish tray gives him great sorting practice. It's helpful to have a segmented tray for the task. Try out this Good Housekeeping Relish Tray recipe for some inspiration. Utensil Utilizer: It's just more fun to stir the squash casserole with a colorful Head Chefs spoon than with a boring stainless steel one! Since it's a hefty splurge, grab a coupon code before ordering. 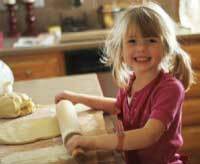 Older kids have more muscle control and ability in the kitchen--and are still enthusiastic to help! Not only can they learn simple cooking tips, but also reinforce key concepts they're learning in school. From adding fractions and experimenting with properties of liquids to reading and following directions, cooking is academics in action. Meat Monitor: Help your child learn about the meat thermometer--stick it in several foods and liquids of varying temperatures. Then explain how hot it should be inside the turkey so that it's completely cooked (180° deep in the thigh). Have her check on the turkey as it cooks to watch the temperature rise. Cookie Decorator: Elementary-aged kids have a blast icing sugar cookies (plus it takes them a long time so you can make good progress on other dishes). Bake, cut and cook the cookies ahead of time, then help your child learn how to hold the icing bag so it doesn't squirt out of the end. Pick up detailed tips on decorating with kids at Real Simple. Mix Master: For simple foods like stuffing or mashed sweet potatoes, let your child dig in with their hands to mix the food. Help him use the rubber scraper to incorporate all the ingredients as well. Recipe Reader: Give your child free access to gather goods--especially larger items in the pantry. Sharpen their literacy skills with new food terminology and turn ingredient gathering into a scavenger hunt. Award-winning Chef and author of father-daughter cookbook Rick & Lanie's Excellent Kitchen Adventures, Rick Bayless advocates total transfer of control to older kids in the kitchen (within good reason, of course). Give the responsibility of preparing an entire dish to your teen and watch him step up to the plate. "Kids will do just about anything, if they're in charge, " he says. If your child isn't interested in food prep, here are some other ways to make him feel included. Home Decor Hostess: For the kiddo who doesn't care to be in the kitchen, recruit his or her decorating and cleaning sensibilities elsewhere. Let her arrange the place settings with fancy napkin folding and put her on post-cooking clean-up duty. Coupon Clipper: Get your older child on board with saving money! Challenge him to use that smart phone for something other than excessive texting, and have him use a mobile coupon app from sites like CouponSherpa.com to save on items in your Thanksgiving shopping list. Incentivize savings by giving him the difference on the retail cost of the food items and the amount he actually spends. The more he saves, the more he gets back in cash! Cake Kings and Queens: For the uptight cook who just can't let go, give your teen a dessert recipe (or let him pick his own). If it bombs, it's just one of many desserts. Why Don’t Young People Vote? 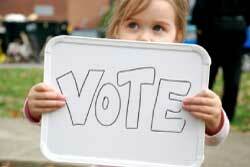 Teaching Kids the Importance of Participation in Their Government!